Mosaic image of The Netherlands created using three Sentinel-1 scans in March 2015. Data Courtesy of Copernicus Sentinel data (2015)/ESA. Two of the satellites launched on 12th January by the Indian Space Research Organization (ISRO) have released their first images. We wrote about the launch two weeks ago, and wanted to follow up on their initial outputs. The first is the exciting ICEYE-X1, which is both the world’s first synthetic-aperture radar (SAR) microsatellite and Finland’s first commercial satellite. We currently use Sentinel-1 SAR imagery for some of Pixalytics flooding and water extent mapping products and so are really interested to see what this satellite produces. One of the key advantages of radar satellites over optical ones is that they can capture images both during day and night, and are not hampered by the presence of clouds. However, using a different part of the electromagnetic spectrum to optical satellites means that although it is black and white image it’s sometimes easier to distinguish objects within it. Zoomed in portion of Netherlands mosaic image created using three Sentinel-1 scans in March 2015. 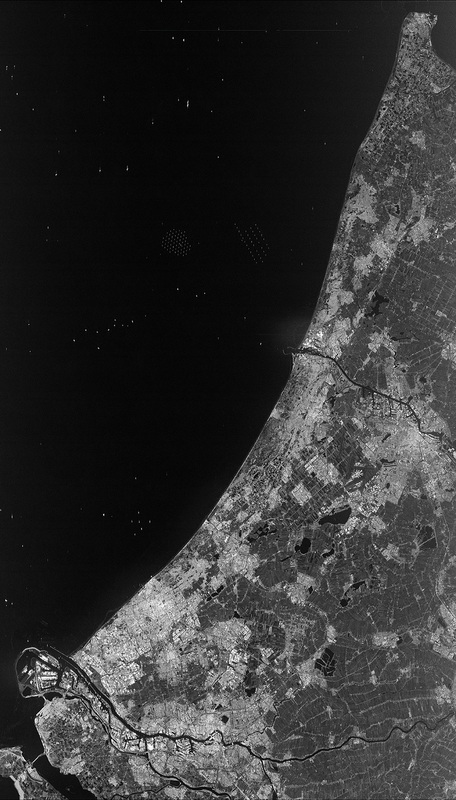 For example, the image to the left is a zoomed in portion of Sentinel-1 mosaic of the Netherlands acquired in March 2015 where you can clearly see couple of off-shore windfarms. Sentinel-1 is a twin satellite constellation and uses a C-Band SAR on board two identical satellites. Over land it captures data in an Interferometric Wide swath mode, which means it takes three scans and then combines them into a single image. Each scan has a width of 250 km and a spatial resolution of 5 m x 20 m, with a six day repeat cycle for an area of land. In comparison, ICEYE-X1 produced its first image with a spatial resolution of 10 m, and it’s hoped to reduce this down to 3 m. It issued its first image on Monday 15th January, three days after launch, showing part of Alaska, including the Noatak National Preserve, with a ground coverage of approximately 80 km by 40 km. The image can be seen here. ICEYE-X1 weighs in at under a 100 kg, which is less than a twentieth of Sentinel-1 which weighed in at 2 300kg. This size reduction produces a high reduction in the cost too, with estimates suggesting it only cost ICEYE around a hundredth of the €270 million price of the second Sentinel-1 satellite. By 2020 ICEYE is hoping to establish a global imaging constellation of six SAT microsatellites that will be able to acquire multiple images of the same location on Earth each day. After this, the company has ambitions of launching 18 SAR-enabled microsatellites to bring reliable high temporal-resolution images which would enable every point on the Earth to be captured eight times a day. Cartosat-2F also sent its first image on the 15th January. The image, which can be found here, is of the city of Indore, in the Indian state of Madhya Pradesh. The Holkar Stadium is tagged in the centre, a venue which has previously hosted test Cricket. The satellite carries a high resolution multi-spectral imager with 1 m spatial resolution and a swath width of 10 km. These two satellites are just at the start of their journey, and it will be interesting to see what amazing images they capture in the future. This entry was posted in Copernicus, Data, Earth Observation, ESA, Flood Mapping, Remote Sensing, Satellite, Sentinel, Space Industry, Understanding Space and tagged Alaska, C band, Cartosat-2F, Copernicus, cuebsats, Finland, First Light, first light satellite images, first satellite images, Flooding, Holkar Stadium, ICEYE, ICEYE-X1, images, Indian Space Research organisation, Indore, ISRO, microsatellites, MOSAiC, nanosats, Netherlands, Noatak national Preserve, pixalytics, S band, SAR, Satellites, Sentinel-1, Synthetic Aperture Radar, water extent, what is ICEYE-X1 by Andy. Bookmark the permalink.